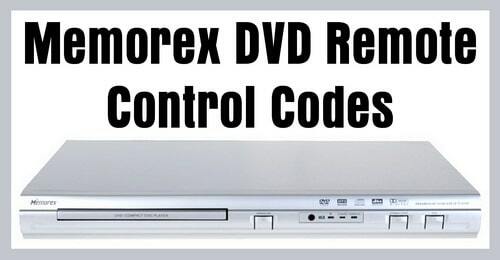 Need remote control codes for your Memorex DVD Player? We have a list of all known and working remote codes that will work with Memorex DVD players. The remote codes for Memorex DVD are 4 and 5 digit remote codes. The remote codes will work with all universal remote controls when programmed using the remote user’s manual. The Memorex DVD codes will also work for SAT and CABLE remotes. If you have any issues with the Memorex DVD remote codes not working, leave your question below with the model number of remote and Memorex DVD. Need more codes for your Memorex DVD? Please leave your question below and we will be happy to assist you further. I have a Dish 3.4 IR remote and a Memorex MVD2016 BLK cd/dvd player. I don’t know how to program the remote or have the right code to use. I have a dish. Network 40.0 hopper remote and am looking for the me or blue ray player cose to use on the DVD button. I can’t get my Element remote to sync to my Memorex DVD player. I have a Memorex MVD2016pnk and I bought a GE universal remote 7252 to use with it (I bought the DVD player used and it did not come with it’s own remote). None of the codes the remote came with are working. Trying to get my Rogers URC-2125BC0-BX Remote to control my Memorex MiTH5005 Surround Sound Receiver/DVD Player, but no codes I am trying are working. Need a code for a universal remote Philips SRP3013 going to a Memorex VCR MVR 2031. Try Memorex VCR codes 0035, 0037, 0039, 0047, 0000, 0240, 0048, 0104, 0046, 0162, 0072, and 0209.